Loviisa is a municipality and town of inhabitants on the southern coast of Finland. 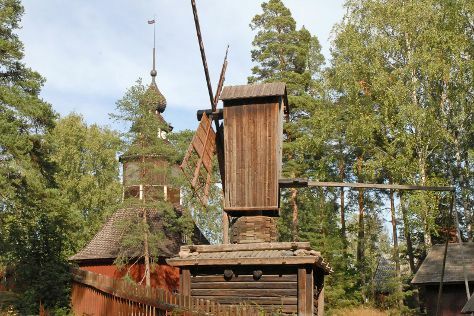 Step off the beaten path and head to Arboretum Mustila and Valkmusa National Park. Get outdoors at Hiidenvuori and Riverside Park. You'll find plenty of places to visit near Loviisa: Kotka (Santalahti Nature Trail & Maritime Centre Vellamo) and Porvoo Old Town (in Porvoo). To find other places to visit, traveler tips, reviews, and other tourist information, refer to the Loviisa online attractions planner . Auckland, New Zealand to Loviisa is an approximately 29-hour flight. The time zone difference moving from New Zealand Standard Time (NZST) to Eastern European Time (EET) is minus 10 hours. While traveling from Auckland, expect a bit warmer days and about the same nights in Loviisa, ranging from highs of 23°C to lows of 13°C. Wrap up your sightseeing on the 7th (Wed) to allow time to travel to Helsinki. On the 8th (Thu), contemplate in the serene atmosphere at Rock Church, get engrossed in the history at Seurasaari Island and Open-Air Museum, then learn about all things military at Sea Fortress Suomenlinna, then pause for some serene contemplation at Helsinki Cathedral, and finally explore the world behind art at Kansallisgalleria. To see ratings, where to stay, traveler tips, and other tourist information, you can read our Helsinki trip maker . You can drive from Loviisa to Helsinki in 1.5 hours. In August, daytime highs in Helsinki are 24°C, while nighttime lows are 13°C. You'll have a few hours on the 9th (Fri) to wrap things up before traveling home.